Originating in the 1980’s, the SyberJet program approach to designing successful aircraft has changed over the years. Currently, SyberJet’s focus is to deliver revolutionary aerodynamics, advanced avionics, powerful engines, and increased cabin technologies. The revamped SJ30i and SJ30x will enter into service by 2019. Within the light jet category, SyberJet creates some of the world’s fastest and longest range aircrafts on the market. With the freedom of a light jet but performance similar to a mid-size, the SyberJet SJ30 series constantly delivers exceptional flights. 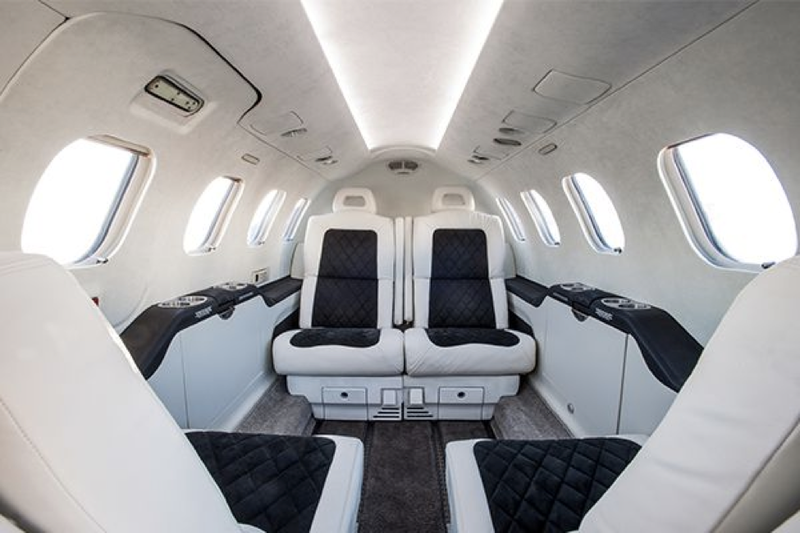 Five to six passengers can comfortably fit within the SJ30 light jet cabin, which was purposefully designed to embody the look and feel of a high performance sports car. Only the highest quality materials are used when designing the cabin, to ensure comfortable and luxurious trips. Passengers can easily access cabin temperature controls and tables that seamlessly pull out and stow away when needed. Dual drink rails at every seat, as well as interior cabinets increase space in the cabin and are easily accessible at any time. Flying farther and faster than any other light jet, the SJ30 business jets have a 2,500nm range and can fly non-stop from Los Angeles to New York or across the entire Atlantic Ocean at a top speed of 486kts. With high swept wings and a T-tail, the SJ30 series jets reduce drag and increases performance. Two mid-mounted Williams FJ44-2A engines also reduce drag, providing 23,000 pounds of thrust each. 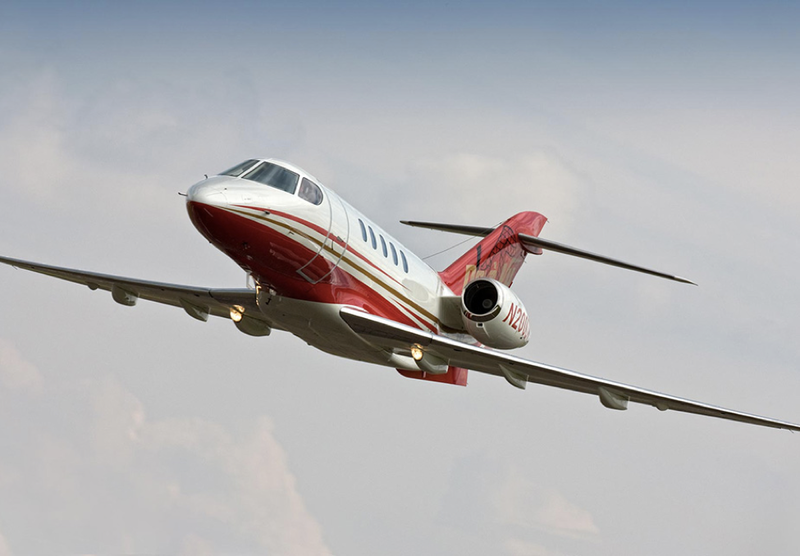 Capable of flying at a maximum altitude of 49,000 feet, the SJ30 light jet is able to avoid traffic, fly above weather, and take more direct routes to their destinations. Undergoing a complete redesign, the cockpit has been improved to provide maximum space for pilots. Additionally, visual clutter is reduced with the repositioning of the engine control panel overhead. 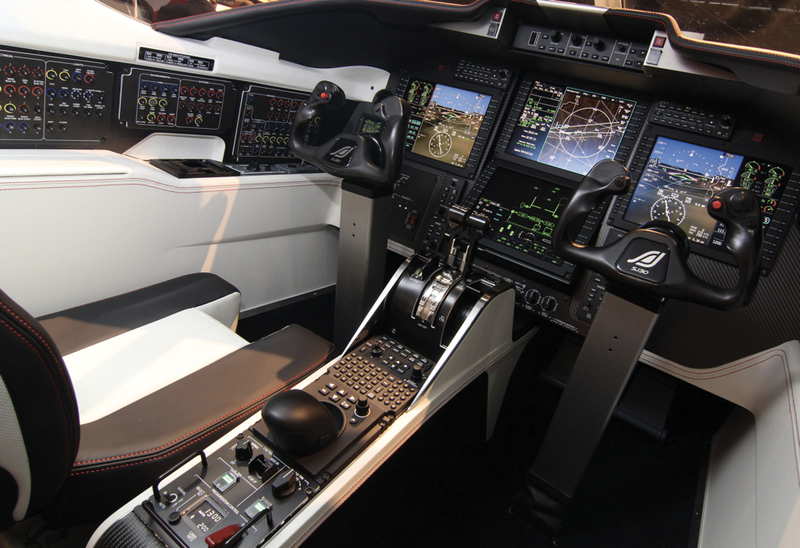 The SyberVision flight deck is one of the most advanced and is based on Honeywell’s Primus Epic 2.0 system. Four 12 inch clear displays provide pilots access to Smartview synthetic vision, moving map display, electronic charts, graphical flight planning, and more. The SJ30 light jets have been FAA certified for single pilot operations. The SyberVision avionics suite include dual flight management systems, increasing intuitiveness during single or dual pilot operations. SyberJet light jets are up to 25% more fuel efficient than similar performing jets. By increasing safety standards, reducing pilot workload, and improving aircraft design, the SyberJet SJ30 family is home to some of the most reliable business jets on the market. The SJ30 light jets are priced between $8.3 and $8.5 million.